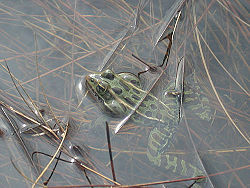 A male Northern Leopard Frog in mid-croak. 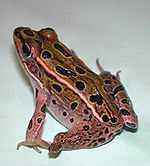 The Northern leopard frog (also called the Meadow or Grass frog) is a species of frog in the family Ranidae. It is a nocturnal frog that can live in wide variety of habitats and is often used in biology books and dissections because of its abundance. But its population has seen a considerable drop due to many factors, such as habitat destruction. Its lifecycle is metamorphic like most frogs; starting as an egg, progressing into a larval tadpole, then adult. It is, however, prone to malformation and will usually die before it reaches maturity when this occurs. When male frogs are three to four years old they begin breeding. The breeding period is from the end of February all the way through May. The males call using their croak to attract a females, the female will also use her croak if she is being held by a male when she does not want to be. As the female swims the male holds on to her using his specialized thumbs as she releases her eggs in a mass of dark colored jelly which is in the water, the female will lay up to 3,000 eggs in the jelly. While the female releases the eggs the male fertilizes them. The fertilized eggs either get attached to under water plants or settle on the bottom of the pond. The eggs will hatch in 10 to 20 days as tadpoles from there it will take until early August before the tadpoles mature into adults, and another two to three years before it is sexually mature. Video of a Northern leopard frog calling for a mate. 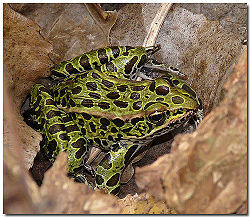 The Northern leopard frog lives around ponds and marshes in North America and Southern Canada . But it can travel away from water, however it can only breed in water so it returns for breeding. Their diet is very versatile because they will eat almost anything as long as it fits in their mouth. They do not chase there food; instead they wait until it passes them and then they pounce on it and eat it. They have been know to eat beetles, crickets, ants, flies, worms, smaller frogs, including their own species, and even birds and garter snakes. As tadpoles they have a different diet: they eat plants, algae, even dead tadpoles or other dead invertebrates. Along with being a predator in there food chain, the leopard frog also is prey to animals such as birds, reptiles, and other mammals. But they have many ways of protecting themselves: they jump into water, bury themselves in mud, or take several jumps and dive into vegetation. This image shows a Northern leopard frog with a deformed leg. Northern Leopard Frog Rana pipiens by Earlham College Biological Diversity 2001, Johanna Mutti, Hannah Putnam, Alexandra "Coco" Shea. Northern Leopard Frog by Dorota, Frogland. Northern Leopard Frog by the National Geographic. Who is the Pickerel Frog? by Western Connecticut State University herpetology. The Northern Leopard Frog by unknown Alberta citizen. Frog, Northern Leopard by the Calgary Zoo. Northern Leopard Frog by the Calgary Zoo.